This easily recognizable designed chair will make a great accent or dining chair. The smooth contours of the chair conform to your body allowing you to sit comfortably. The durable matte plastic molded chair and geometric chrome base provides an artistic appeal. 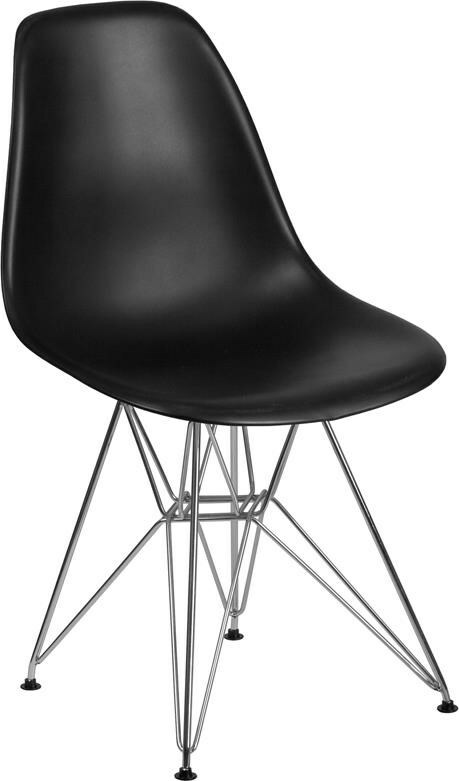 The Elon Side Chair Series Black Plastic Chair with Chrome Base by Winslow Home at Sam Levitz Furniture in the Tucson, Oro Valley, Marana, Vail, and Green Valley, AZ area. Product availability may vary. Contact us for the most current availability on this product. Browse other items in the Elon Side Chair Series collection from Sam Levitz Furniture in the Tucson, Oro Valley, Marana, Vail, and Green Valley, AZ area.